During the holidays we make a lot of pinto beans for our tamale dinners. I always freeze the left-overs for future use like when I am looking for appetizers to serve our New Year’s Eve guests. The fried platano cups have the flavor, weight and heartiness of a fried potato skin. You can find these, plus the queso cotija and crema Mexicana in a Latino grocery store or even at more of the larger grocery chains. Don’t fret if you can’t find the plantain cups in the frozen section. 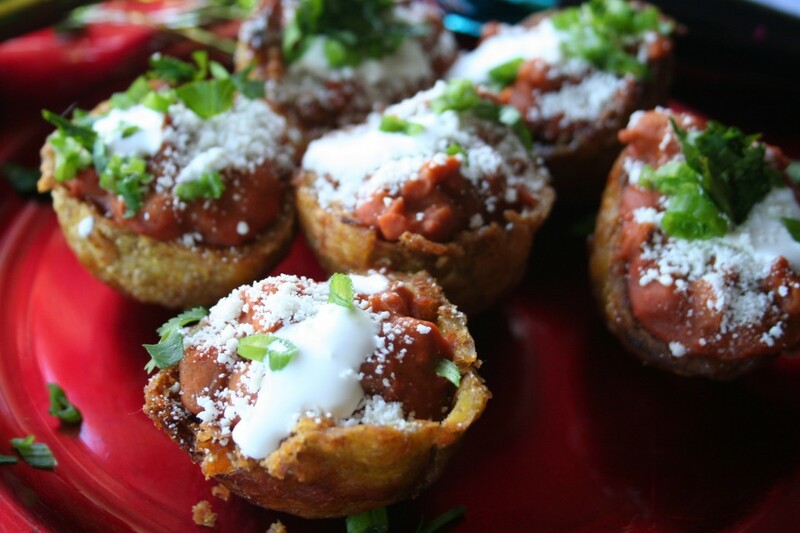 I also make these chorizo and beans hearty appetizers with the tortilla chips that are formed like a scoop. They are perfect appetizers you can assemble and leave out for your guests to enjoy as they kick-off the New Year. It will give them just enough spice to awaken their appetites for more of your delicious New Year’s Eve spread. Fried Plantain Cups (Tostones para Rellenar) — Goya has some good ones. Place the package of pork chorizo in a medium-large skillet over medium low heat. Allow the chorizo to cook down. Add refried beans and mix well, stirring until nice and hot. For the Fried Plantain Cups, in a skillet preheat enough oil to cover the plantain cups. Fry four or five minutes until golden, stirring and flipping occasionally. Cuidate with this process as they suggest to fry them when they are frozen. You know how much hot oil loves frozen items. Drain on a paper towel. Spoon about a tablespoon of the chorizo and bean mixture into the plantain cups. Add a small dollop of crema Mexicana on top and sprinkle with the queso cotija, cilantro and green onions.